In our first article we mentioned the importance of training with a bunch. Hopefully you have been practicing this skill as it will certainly help you with the C2K Bike Ride. You will probably have been in some very good bunches and some not so good. The following are some tips in the art to riding in a bunch. Riding in a bunch is very social and a great way to catch up and meet people, but you need to ensure that you are still paying attention to the road, the riders around you and your environment – like traffic lights, hazards, cars etc. The key to a good bunch is that they are smooth in the speed when changing from 1 lead rider to another. The riders on the front work harder and shield the riders behind. If there is a head wind or you are riding at a fast pace then you would change front riders quickly so they don’t fatigue. The riders from the front move to the back of the bunch smoothly and recover until their next turn. If you don’t feel strong enough compared to the rest of the bunch then you can either roll through and then roll off the front straight away or sit on the back and not roll through. A bunch that rider together regularly normally have a set of rules that they follow, such as all stopping for a mechanical, designated re-grouping points etc. It is good to know these ‘rules’ when joining a new bunch that you will regularly ride with. Starting out: Before joining a bunch ride make sure you are comfortable riding close beside another rider without wobbling, are able to ride a very straight line even when having a drink from your bottle, can ride with one hand or sitting up to observe traffic coming from behind. It is very important to be comfortable in close proximity to other riders. Avoid sudden braking and changes of direction. Try to maintain a steady straight line. Remember that there are riders following closely behind. To slow down, gradually move out into the wind and slot back into position in the bunch. By putting your hands on the hoods on your brakes you can “sit up” and put more of your body in the wind to slow down slightly without using your brakes. Ride safely and try to stay off the brakes. If you are inexperienced and too nervous to ride close to the wheel in front of you, stay alone at the back and practice. When the pace eases, don’t brake suddenly, instead ride to the side of the wheel in front and ease the pedalling off, then drop back on the wheel. Practice on the back and soon you will be able to move up the line with a partner. The most common way to take a turn on the front of the group is for each pair to stay together until they get to the front. After having a turn on the front (generally about the same amount of time as everyone else is taking), the pair separates by one rider either rolling forward or both riders moving to each side, allowing the riders behind to come through to the front. To get to the back, stop pedalling for a while to slow down, keep an eye out for the end of the bunch and fall back into line there. It is safer for everyone if you get to the back as quickly as possible as the group is effectively riding four-abreast until you and your partner slot in at the back of the bunch. Avoid surges unless you are trying to break away from the group. Surges cause gaps further back in the bunch, which in turn creates a “rubber band” effect as riders at the back have to continually chase to stay with the bunch. This is particularly evident in larger bunches when cornering or taking off from standing starts at traffic lights where the front of the bunch can be almost at full speed before the back of the bunch is moving. When you finally make it to the front, don’t ‘half wheel’. This means keeping half a wheel in front of your partner. This automatically makes your partner speed up slightly to pull back along side you. Often half wheelers will also speed up, so the pace of the bunch invariably speeds up as the riders behind try to catch up. This is the very annoying symptom usually of somebody who is a bit nervous and excited. Not wanting the rest of the group to end up being next to each other in their pairs, (or not wanting the other guy to think that he’s better than you), you speed up to match his pace. But, he still needs to be that little bit in front so he speeds up – again, until everyone in the bunch has gone up two or three gears and 10km/hr and no one is particularly happy. REMEDY – when you are second wheel, make sure you know the general speed of the bunch, when you go to the front, keep your speed around the same, and keep your wheels and handlebars in line with the person next to you. You and your partner need to do some planning when you get on the front so that when you roll through you come off at a place where the road is wide enough for the group to be four-wide for a short time if rolling that way. With some planning, it is often possible to come off the front a few hundred metres earlier or later to avoid a dangerous situation and avoid unnecessarily upsetting motorists. If riders push in somewhere in the middle of the bunch rather than retiring to the back after taking a turn, cyclists at the back will not be able to move forward and take a turn of their own. This will make them very cranky and colourful language may ensue. No one wants to be stuck down the back of the bunch for the entire ride and subjected to the “rubber band” effect. Remember that riding in a bunch is about all riders sharing the workload. Pedal downhill when at the front of the bunch. Cyclists dislike having to ride under brakes. Point out obstacles such as loose gravel, broken glass, holes, rocks or debris on the road, calling out “hole” etc as well as pointing is helpful in case someone is not looking at your hand when you point. It is just as important to pass the message on, not just letting those close to the front know. Another obstacle is a parked car, call out “car” and sweep your hand around your back to let people behind know. Point out runners or walkers on bike tracks and slower bikes if you are passing someone on the road. When traffic is approaching the lead bunch the call is “car back” and when a car is approaching the front of the bunch the call is “car up”. Theses calls are usually voiced when the road narrows and it’s important to advise the people further up/down the bunch that a car or truck is approaching. An appropriate gap between your front wheel and the person in front is around 50cm. Keep your hands close to the brakes in case of sudden slowing. Sometimes people who are not used to riding in a bunch will feel too nervous at this close range – riding on the right side is generally less nerve-racking for such people as they feel less hemmed in. Watching “through” the wheel in front of you to one or two riders ahead will help you hold a smooth, straight line. Maximise your energy savings by staying close to the rider in front. Cyclists save about 30 per cent of their energy at high speed by following a wheel. Each time you leave a gap you are forcing yourself to ride alone to bridge it. Also, riders behind you will become annoyed and ride around you. If you are in the bunch and there is no one beside the person in front of you, you should move into that gap (otherwise you will be getting less windbreak than everyone else will). Conversely, if you are that person and no-one moves into that gap beside you, you should move to the back of the bunch, the next pair to roll off will come back and one of those riders will fall in beside you. A slight direction change or gust of wind could easily cause you to touch wheels with the rider in front which may result in a fall. Try to stay relaxed in your upper body to absorb any bumps. This is a part of riding in close bunches and is quite safe provided riders do not panic, brake or change direction. Many riders, even the experienced ones, freewheel momentarily when they first get out of the saddle to go over a rise or a hill. When doing this, the bike is forced backwards. This can cause chaos in a tightly bunched group of riders. The sensation of the rider in front coming back at you is unpleasant and can cause crashes. Try to keep forward pressure on the pedals when you get out of the saddle to avoid this situation. which can cause a sudden deceleration. This can often catch a rider who is following too closely, resulting in a fall from a wheel touch. When riding with a partner in a line of two’s, stay close. Don’t ride too far away from your partner because the wheel in front of you intimidates you. The gap you’ve left between you and your partner is a waste of space and to a motorist behind, it appears that you are three wide. This is a good way to antagonise motorists. If you are travelling on a multi-lane road, it is permitted and often best practice to actually take the left lane. This effectively means that traffic does not squeeze past, but actually changes lanes to pass; giving everyone plenty of room. Never use your aero bars in a bunch ride – not even if you are at the front. Using aero bars means that your hands are away from the brakes. Aero bars are for time trial or non-draft triathlon use only. 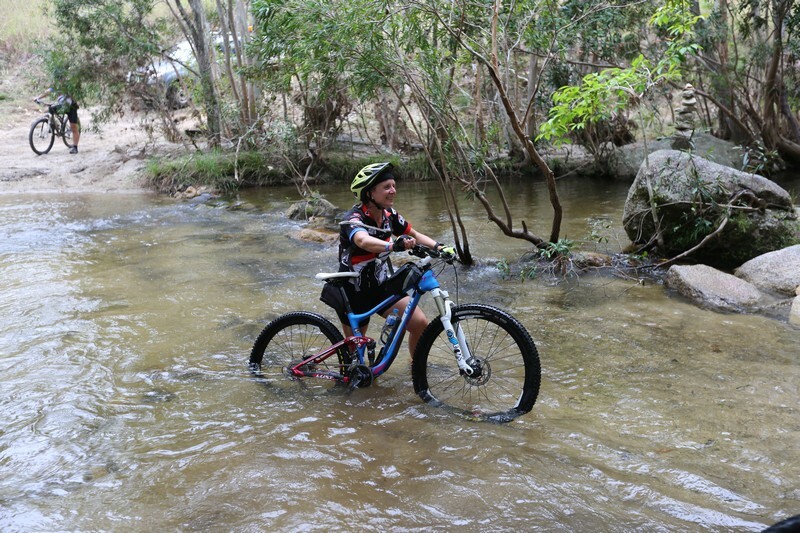 Experienced riders should point out any mistakes made by less experienced riders. This must be done diplomatically of course, but it is important to make people aware of unsafe riding and help them learn the right behaviour. Riding in a bunch is about everyone’s safety. when in front, remember you have the responsibility of guiding the whole group who are following along behind you. 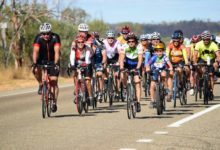 We hope practice these tips in your bunch riding in the lead up to the Cairns to Karumba Bike Ride. The fluid you drink while riding is taken to replace water and electrolytes lost through perspiration. You also lose fluid when you breathe, but this is of lesser importance. The amount of fluid you consume will vary depending on how hot it is when you are riding and how much you perspire. The hotter the day and the more you perspire so the more fluids and electrolytes you’ll need to replace. 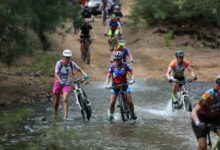 Again, each individual has their own specific hydration needs, so it’s important to experiment while out riding until you find out what works for you. Hydration can be complicated further because many people rely on the carbohydrate in the sports drinks to provide them with their fuel as well. On cooler days, they may not be drinking enough of the sports drink to meet their 30-60 grams of carbohydrate per hour requirements. If this is the case then supplementing their sports drink with a snack will help. Drinking too much on a cooler day means you may need to go to the toilet more often to expel the extra water. Also, on the hottest part of really hot days you may not be able to consume enough fluid that you lose. If you know that you are going to be riding through the middle part of a really hot day it’s important to ensure that to keep on top of your hydration earlier on in the ride. By doing this, you’ll be less likely to run deeply into hydration deficit before the mid-day heat. Headaches are a sure sign that you are dehydrated. If this happens, let your ride leader know. 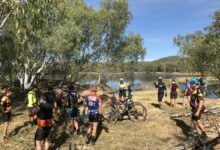 There are regular water stops along the C2K route so ensure that you tell your ride leader that you need to stop if you’re running low on water. Make sure you fill your water bottle before you leave the stop including the lunch stop. Also remember to stay hydrated throughout the day post ride. Good luck with your preparation! The next article will discuss bunch riding techniques. A seasoned cyclist will have enough carbohydrate stored in their bodies to provide them with around one to two hours of high intensity cycling. Once the carbohydrate stores are depleted the cyclist then “bonks” or hits the wall. If you are riding at a more leisurely pace, then you’ll find that your carbohydrate stores will last longer than if you are riding at race pace. There are two standard protocols for endurance sports nutrition. The 30-60 grams of carbohydrate per hour and the 1 gram per kg of body weight per hour. I recommend that you adopt the 30-60 grams of carbohydrate per hour nutritional protocol if you plan to ride at a leisurely but steady pace. If you plan to ride at a race pace, then the 1 gram of carbohydrate per kg of body weight per hour is a more suitable nutritional protocol to follow. 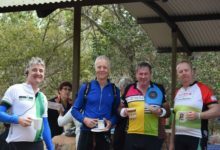 These carbohydrate requirements can be met by consuming a variety of combinations of sports drinks, sports bars and gels and normal food like fruit, ANZAC biscuits, fruit cake and sandwiches. I also recommend that the faster you go the more you’ll want to rely on products that are able to be consumed and digested quickly like sports drinks, gels and sports bars. If you are ride more leisurely then you will have more time so you can choose “real” food to fuel you. Most products now have their carbohydrate content listed on the outside of the packet. This makes it relatively easy to work out how many of them you’ll need to eat per hour. Most gels and sports bars contain around 20-30 grams of carbohydrate so consuming two to three of these products per hour will generally meet the majority of most people needs. Remember that these are guidelines only! As everyone has their own preference to the type of food they prefer to consume, I strongly recommend that you experiment to work out your nutritional requirements during your training leading up to the C2K. Also, people with larger builds (heavier) consume more carbohydrate per hour than smaller (lighter) built people. Please take this into consideration when working out your nutrition plan. Good luck with your preparation! The next article will discuss hydration.